Education has had to adapt as an entity over the years, as it is passed off to different administrations and a variety of leaders. What has stayed consistent is educators’ flexibility, their ability to make the current system work for them and for their students. The system itself is supposedly built to cater to students’ needs, although it does not always follow through on this goal. A great responsibility falls upon the dedicated teachers in classrooms to invent and develop new ways to reach students, sometimes with very limited resources and outside assistance. How can technological advances help us in this struggle toward better understanding? I would argue that preparing our students for a technological future is the only rational response to an evolving human race. Most students now are more adept with technology and machinery than a majority of adults, and the ones who learn to use these tools most quickly tend to succeed at a higher rate. As teachers, we prepare young students for the struggles they will face in the “real world” – what better way to mimic those challenges than by presenting problems and solutions using technology? Projectors alone have revolutionized how students and teachers interact with class material. With projects and lessons projected onto a screen, everyone has an equal opportunity to see what the teacher is doing with a specific example. The teacher can create a one-on-one experience even as he/she is speaking to the big group because they can see the hand motions and the actual writing in real time. Power points of notes, recordings of voice instructions, and videos of demonstrations on the internet have made a huge difference in the variety of input methods we can use in the classroom. For the auditory learner, there are several more options than simply the teacher reading aloud, so they can hear a variety of voices that mimic ones they will hear outside of the classroom. 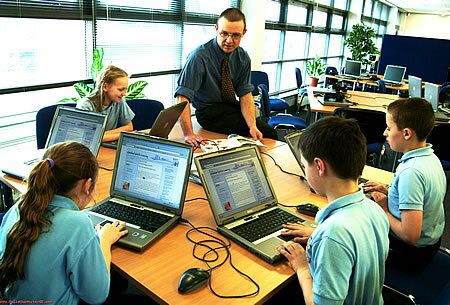 Apps on computers and tablets also provide an individualized learning experience. Students can work at their own pace and be monitored by teachers without even being in the same room. Homework becomes easier when the material is portable, and learning becomes more important to students when the method is personalized. Students can also get homework help answers from their peers using technology. This is great for all concerned and students get to understand everything better with the use of technology. Technology is not going away any time soon – the more quickly we realize that and adapt to connect, the more successful our educational system will be.